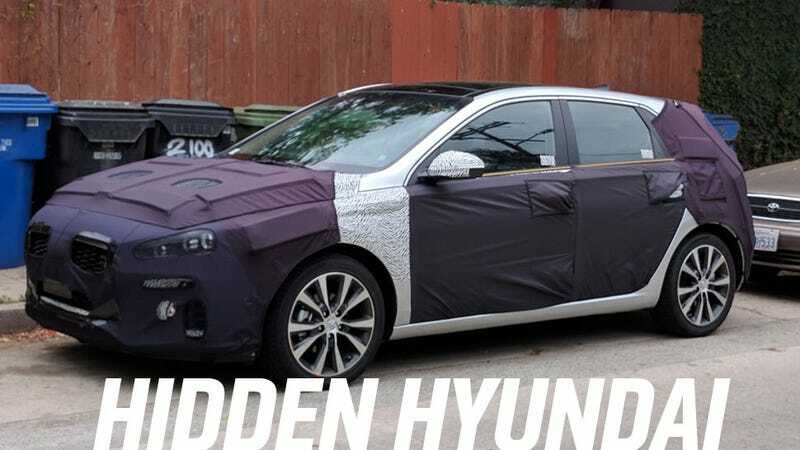 Is This The Next-Gen Hyundai Elantra GT? My friend Tom was driving around in the Silverlake area of Los Angeles yesterday, and spotted this well-disguised mule. No badges were visible, of course. Well, none on top. Below, it’s full of Hyundai-tagged bits, and this seems to be the next Elantra GT. The Elantra GT is a sort of under-rated car, I’ve always thought. It always seems to be the one people forget about in the compact four-door hatch/wagon segment, but that’s sort of a shame, because it’s not bad at all. Maybe this new version is so heavily disguised because they’re actually trying to make it more exciting? Maybe? Take those odd bits of thick cladding on top of the hood, for example. What are those hiding? Most body panels are just covered with that purple vinyl or that zebra tape, so why the big hood panel covers? Maybe they’re hiding indicator tell-tales done right, unlike the Mustang? Maybe a hood-mounted tach? A huge air intake, like a shaker hood? On-hood hibachi? There’s so many possibilities, and the chances that the actual thing will be a normal, mundane hood are so high that it’s positively dizzying. Still, the proportions look decent, and it looks to have a Kia-esque grille under there, which isn’t bad, since the Kia arm of Hyundai-Kia has been putting out some pretty handsome cars lately. This really seems to be a late-cycle testing mule for the 2017 or maybe 2018 Elantra GT. I suppose we’ll find out soon enough, so maybe hold off on that Golf or Fit purchase for just a little bit longer, if you can.